There comes a time each spring when the rush and excitement of the new growing season wears off and the realities from the previous year come back to haunt you. There will be bugs, there will be snapped stems, the rabbits will eat the lettuce, and you will get hot and sweaty mowing the lawn. It all seems like a lot of work and all the while the weeds keep growing. But there’s plenty of magic. Onions have been entertaining me lately and I’ll start with allium moly “Jeannine”. 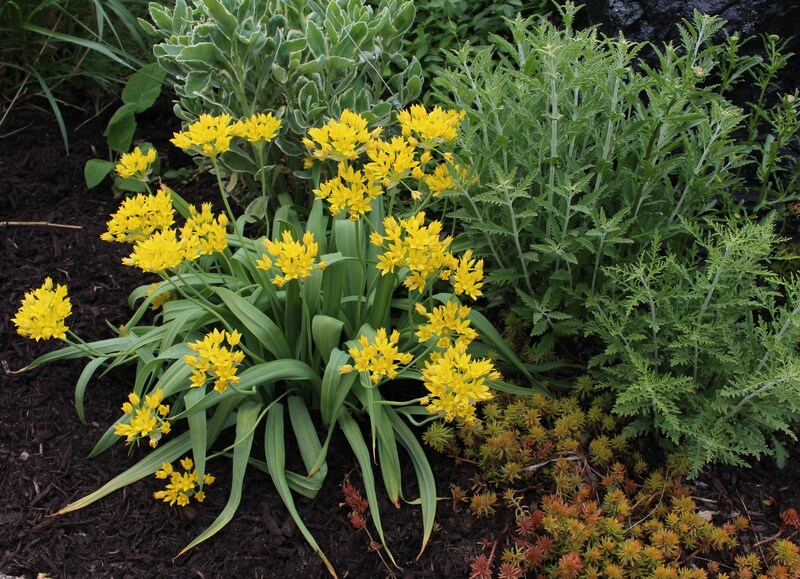 allium moly “Jeannine” with sedum “Angelina” and a few perovskia seedlings. I like how the one perovskia has much fernier leaves than the other. For some reason I used to dislike most of the flowering onions and only just recently let a few into the garden. They seemed kind of weedy and never wowed me…. but I’ve been dabbling. The big purple ones are a no brainer, and last fall I cracked open the wallet for this one (who’s name I can’t recall at the moment). Surely a half dozen would have been nicer but gardening funds were short after snowdrop ‘dabbling’. The front border is just coming out of a lull as the daisies and roses fire up. Allium “Pinball Wizard” (I looked it up) has large blooms on short stems, all out of what I consider the “globemaster” family since they all seem similar to me. Also new this year is allium nigrum, a ridiculously cheap white allium with good sized blooms on nice stems. I like it! The only complaint I have is the season falls right into oxeye daisy season, and the allium blooms are lost among the ‘common’ daisies. 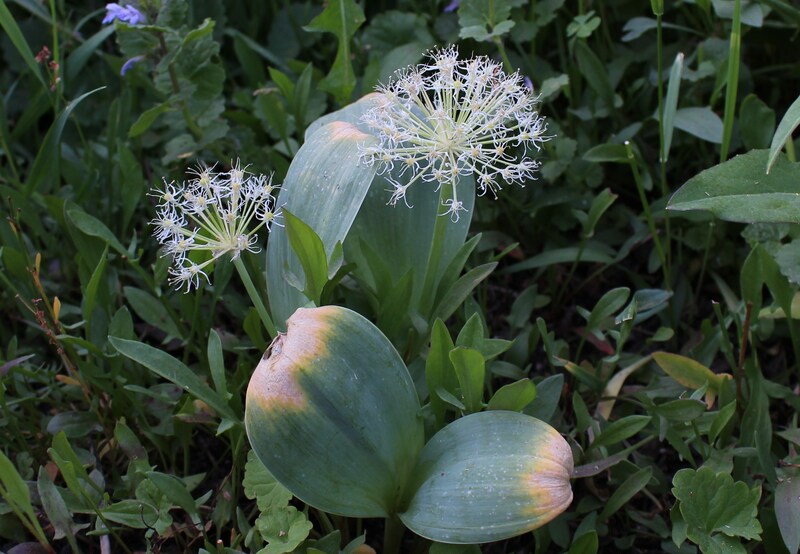 Less impressive is my neglected allium karataviense “ivory queen”. I like the foliage as much as the actual flowers since they have a cool pleated gray look that reminds me of some fancy South African bulb. You’ll have to trust me on the foliage, it looks better in the weeks coming up to flowering. Plus this little “ivory queen” is just praying for someone to take it away from all this weedy mess. Not an allium anymore (it’s been reclassified as nectaroscordum siculum) the Sicilian honey garlic is a bit of a floppy mess in my yard. The stems twist around and then put up these ‘interesting’ blooms for a week or so before dropping back down into flopdom. Can I finish off with an onion from the vegetable patch? This is allium fistulosum, nebuka evergreen bunching onion. Supposedly it’s a tasty onion, but I have yet to give it a try. Instead I’m enjoying the long lasting, fat bloom heads. Nebuka onion, another subtle effect but it’s carefree, edible, and fuzzy! 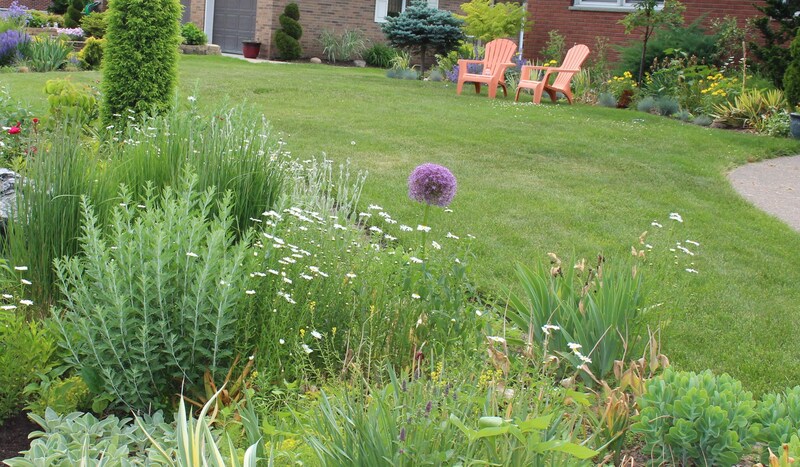 This entry was posted in garden, late spring, perennials, spring bulbs and tagged allium, allium moly jeannine, allium pinball wizard, flowering onions. I planted a nectaroscordum last fall, but so far I haven’t seen a sign of it. I don’t even remember where I planted it. I guess I better go look that up. Good luck, it should be just about in bloom right now and you can decide which side of the fence you stand on…. Subtle beauty or underwhelming mess. The nectaroscordum is just the same in my garden. I searched for it for ages but am now thinking of pulling it out, I’ve had it a few years now and it never stands up straight! Love you other alliums especially the last edible one, that’s really fun. I suppose if it was carefully tended on the edge of a stone wall, and could be admired from below…. Then it could be a unique showpiece, but to be honest I dug most of it out last summer and gave it away! I haven’t mustered the courage to eat more than a few leaves of the nebuka onion, and the chef here is remarkably unadventurous when it comes to new vegetables…. I have a few alliums too, and am often disappointed with them, but I like the look of your shorter Pinball Wizard one, and Jeannine is very pretty too. I bought a mixed bag last autumn and a few have been lovely, but no idea what the names are! I’ve also had plenty that didn’t seem to be worth the trouble, but moly seems happy where she’s at (although the other two patches are dwindling) and the large purple ones always add something special to a bed…. But what purple flowers don’t add a bit of special? I love all your alliums, especially Ivory Queen. We are enjoying all our alliums at the moment, they make a real statement in the garden. I seem to be the only one whose nectaroscordum know that they have to stand to attention when I’m passing, actually they have other plants to hold them up! Maybe I should try adding a few sober neighbors. Perhaps there are more upright strains or forms. I’ve seen a few listed as more impressive but they’ve never made the final cut when ordering. You have some interesting alliums. ‘Pinball Wizard’ is attractive–I’ll have to look for that one. I added allium nigrum last year and it has been underwhelming so far where I planted it. I’m always smitten with my newest plants, we will see if the opinion changes next year! I’m going to try and convince a friend of mine that his alliums should be dug and divided… They need it but I think he’ll see right through to my plant stealing motives. I like your Alliums, specially Ivory Queen, I haven’ t seen that one before. I am always a bit wary with Alliums as I have had some which have become weeds with their over enthusiastic seeding. Nectaroscordum is a weed here and I’ m not that mad on it. Specially now that it has changed its name and I can never remember how to spell it. My favourite ones in my garden are Purple Sensation, Allium sphaerocephalon and I can never resist the spiky metallic balls of Allium christophii. Except of course christophii, there’s one lone seedling in that pot. I have to get the yellow ones. I have the blues and purples out the wazoo. I love them in spring. Blooming right now I have a short one with a big, thinly spaced globe that a friend gave me and I don’t like them one bit. Maybe next year when they get more mature I will even figure out what variety I have. I had trouble with the whites too. They never looked like the photos in the wholesale catalog. I like your orange chairs. They really stand out and make a statement. I think I know which one you’re talking about, with the short thin blooms. I’m ‘into’ alliums right now, but haven’t fallen for them as hard as I do other plants. We’ll see how long it lasts! I’m glad you like the chairs. I couldn’t afford any of the fancy, classy, garden seating so I settled for these. I consider them the pink flamingos of this century! The only redeeming factor of Nectaroscordum in my garden is it’s blooms echoing with Calycanthus Hartlage Wine’s flowers. But it’s flower stalk moves around like a snake and the bloom head pops up just above the ground. Cannot be staked. I pulled off a whole seedhead and it stinks! yuk . Bittster, what specific conditions to you have for your allium mollys? How old is that clump? You’re absolutely right, it doesn’t flop as much as it ‘snakes’ along the ground. It does look like a mess all the time. I really like the Allium moly. (Has anyone come up with a cultivar yet called ‘Holy Moly’? If not, it’s just a matter of time.) 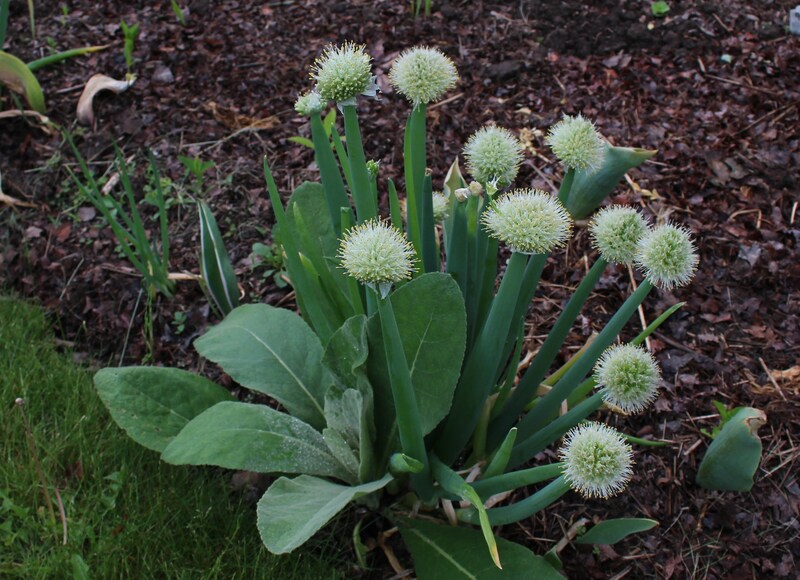 If your ‘Globemaster’-type allium is anything like mine, you will soon have a nice clump. 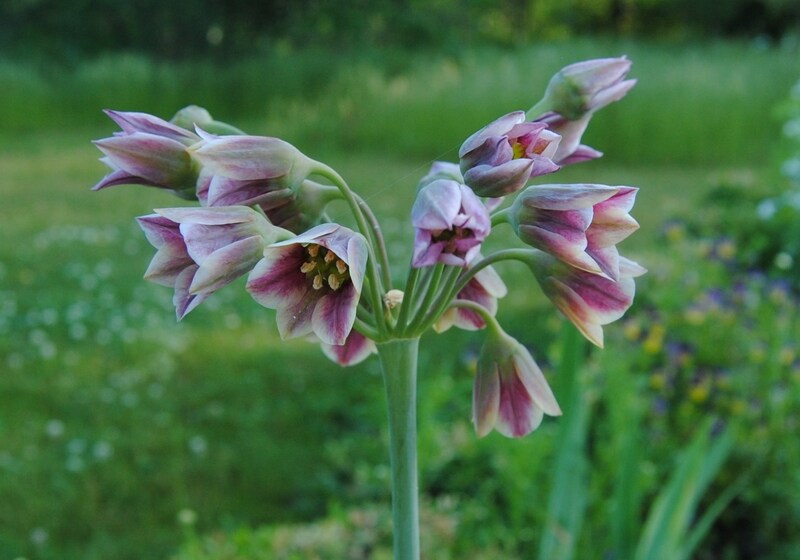 heh heh, I think there’s a hosta called holy moly, but no allium…. yet. I’m looking forward to a clump. I had a couple of a different kind, but divided and gave away a bunch. Don’t know what I was thinking, I’m usually much greedier. Your alliums are wonderful. They do add a note of fun in any garden. I like that they cane be used formally or for whimsy. Hi Jayne, and thanks! There really is nothing else with a bloom quite like the alliums. I found a lot of great tips for new plants to try…Thanks for the tips. what is the name of the plant that is growing right next to that Nebuka onion plant?? It’s a verbascum, a weed actually but I like the big, fuzzy leaves and if I leave it long enough it will put up a 6 foot bloom stalk (also fuzzy) with small yellow flowers. You often see them growing along the highways in poor gravelly spots.